Aquamira® Water Treatment Drops are already the go-to water treatment system for thru-hikers along the Appalachian Trail. Now, West Coast hikers can utilize the same water treatment technology, already embraced by serious outdoor enthusiasts everywhere. Hiking in California just got a whole lot easier now that Aquamira® Water Treatment Drops have been registered for sale in “The Golden State.” Previously unavailable in California, Aquamira Water Treatment Drops are the ideal water treatment system for longer hikes or backpacking trips and group water treatment. Aquamira Water Treatment Drops contain chlorine dioxide, an active ingredient, proven effective against protozoa and bacteria. The water treatment system easily treats up to 30 gallons of water and is also useful as a preservative for stored drinking water. Perfect for emergency kits, foreign travel and outdoor activities, Aquamira Water Treatment Drops’ small size, portability and long shelf life allows this highly effective water treatment method to be easily carried and used by individuals anywhere in the world. 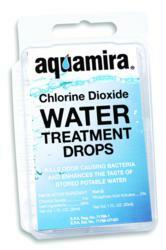 Aquamira Water Treatment Drops are EPA-registered and now available in all 50 states. For more information, please visit: http://www.mcnett.com/Water-Treatment-Drops-P208.aspx. Aquamira, the water treatment brand distributed by McNett, features a variety of portable water filtration and purification products that effectively treat water in all kinds of environments. Included in the Aquamira line are the Frontier™ Emergency Water Filter System, the Frontier™ Pro Portable Water Filter System, Water Treatment Drops, Water Purifier Tablets, Sport Bottle Micro Filter and the newly redesigned Water Filter Bottle with CR-100 capsule filter. For 30 years, McNett has manufactured and marketed the finest specialty products for the outdoor, sporting goods, dive and tactical gear markets. The company’s products are known worldwide by consumers and original equipment manufacturers. McNett brands are available in over 70 countries and include: Outgo™, Gear Aid™, M Essentials™, Aquaseal®, Seam Grip® and Freesole®. For more information please visit http://www.McNett.com.